Color corrected infinity optical system. Long working distance objectives, great image Ergonomics physical design, various accessories for option ---Specially design for observation of cell structure. Color corrected infinity optical system(CSIS), excellent optical performa nce and great image. Application of high-contrast and low chromatic phase contrast observati on, access to detailed examination of internal structure of the cells. Supply long working distance and high N.A. objectives to get flat and cl ear image. Long working distance condenser has capacity to use revolution bottle and suit for various sample containers. Well-designed body structure, durable, high resistance of vibration. 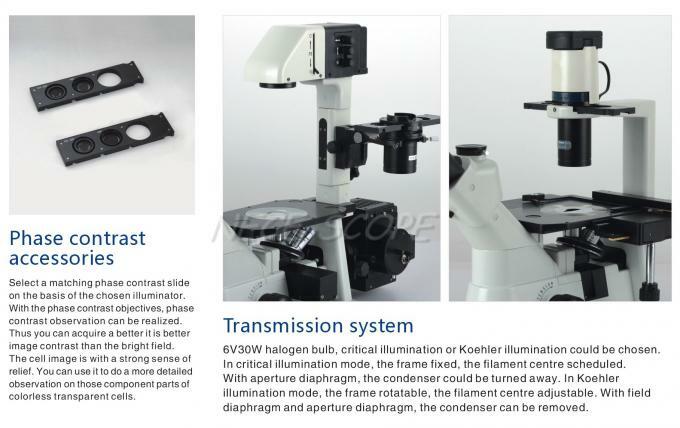 Professional vertical fluorescence technology, to get clear and bright flu orescent image. Specimen holder Holder for specimen glass (also for φ54mm Tissue culture vessel). Terasaki holder(also for φ65mm Tissue culture vessel). Illuminator Critical illumination, 90-240V wide voltage, 6V/30W halogen bulb, center presetting, brightness adjustable. N.A.0.3 condenser, W.D.72mm, dismountable.